The teachers found out I was being transferred to another school in early July. English Course found out shortly thereafter. The whole school found out at closing ceremony in mid-July. But I was there until August 2nd. I was basically saying “goodbye” for a whole month. There were some interesting interactions with students and teachers during this time. On the 11th I went to the School for the Blind, potentially for the last time. The student who only goes to class when Final Fantasy is involved had the flu and went home after taking a make-up test, so I didn’t get to see him. The teachers said they were sorry that I might not be able to go to their school anymore, but both the principal and vice-principal said they would check with my new school to see if they could borrow me sometime. I don’t know how that went. After the music, we played a “maru batsu game,” which is a true/false game. Before the party the students emceeing had asked me several questions, so that then they could use them in the game. In the first round, nearly everyone was eliminated when they answered that the statement “Eli is from Michigan” was false. ^o^; I guess between being from Honduras, the States, Michigan, and Detroit, they just couldn’t keep it straight. That same day was my farewell dinner with the teachers. We went to a Japanese restaurant. In the room the teacher figured I should sit at the seat of honor, called the “kamiza” (上座), but then I’d probably be far from everyone, as it most likely was a seat deeper in the room. So I said I should sit in the middle aisle to be able to talk to people at both tables. But I guess it was unsatisfactory, so the teacher asked the waiter where the kamiza was. After answering, he suddenly spoke to me in English: “Are you special today?” I said I was, and he then asked me, “Are you on the JET Program?” I was surprised, but before I could ask how he knew about JET, some other customers came in and he went to attend them. Throughout the dinner, the teachers made speeches. I was happy to hear that they had appreciated my work at the school, since it’s not something you always hear in the course of everyday work. When it came time to make my speech, I asked if I should do it in English or Japanese (since the two vice-principals were also in attendance), and they said, “Both! Translate for yourself!” So I rambled on a bit in Japanese, translated it, rambled some more, admitted I hadn’t actually prepared a speech because my head was just full of all the different speeches I’d have to make, and then just said “thank you.” I couldn’t think of a smooth way to wrap it up, ahaha. Then, they gave me a present that many teachers in the school had pitched in to get: a gold necklace with two charms! After the dinner, we went to karaoke. There was only one hour left before the last train, and since it was my nijikai and they knew how much I liked karaoke, everyone decided to either stay in a hotel or share cabs back home to be able to stay longer! We finished at 1AM. My co-ALT and another teacher split a cab back to our own neighborhood. Between 3 people it was only 2000 yen each, which I think isn’t bad at all. I was pretty unsure what to say for my farewell speech to the whole school at Closing Ceremony, since I never imagined the terms in which I’d be leaving. So I just started with the usual feel good stuff: some poetic descriptions of the scenery on the way to school, memories with the students in brief, and thanking the teachers. I was a bit worried about my “message to the students,” because of the possibility I was oversimplifying Japanese culture. I talked about the dreaded nail that sticks out. I don’t really know what people thought of it; though some teachers told me, “Great speech,” I have to wonder if that means all of it was great, or they were just impressed that it was in Japanese and I had it mostly memorized. Later, one student said to me that it had been “moving.” What mostly convinced me that I hadn’t stuck my foot in my mouth was that I was reminded to write something for this year’s school magazine shortly after the ceremony. Yayz! But going back to closing ceremony…it was actually a bit funny. 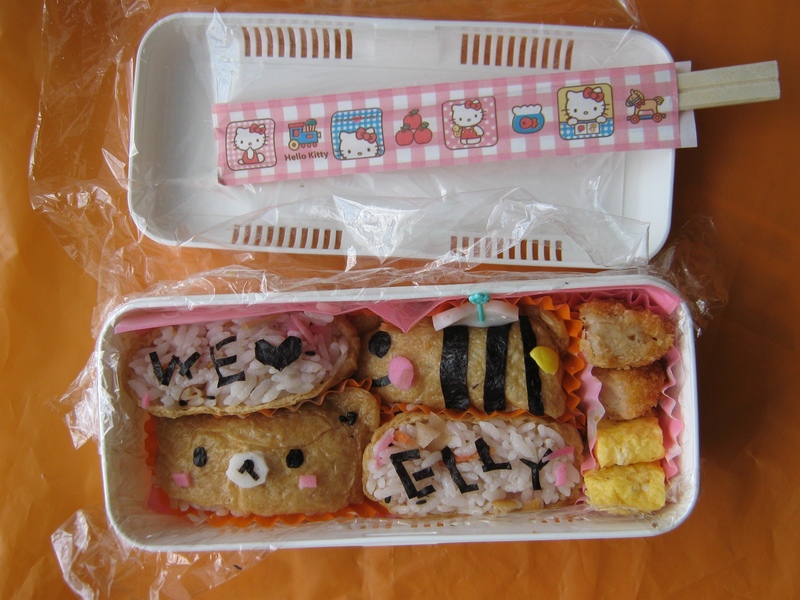 That morning I was in the jimushitsu ordering a bentou when I noticed one of the English Course students walk in. I didn’t pay much attention, but when I heard one of the secretaries say, “The person themselves will see you!” I looked up and saw the student walking out with a bouquet. I thought, “ah, it’s my farewell bouquet. I wonder if that student will be the one to hand it to me?” Indeed, it was. It was a student who had lived in the States for a couple of years. The Student Council President said some remarks on behalf of the students, and the English Course student translated these to English. 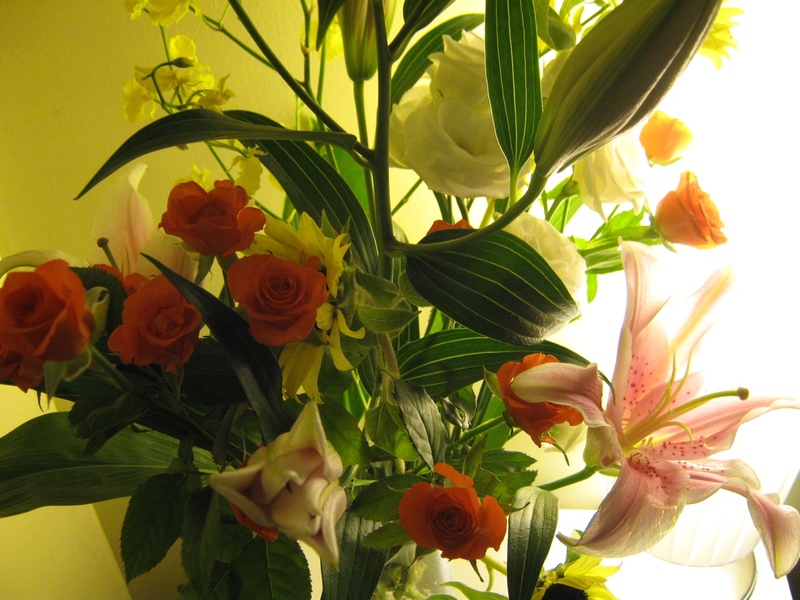 As he handed me the bouquet, it looked like he was blinking a lot not to cry, and I thanked him by name. 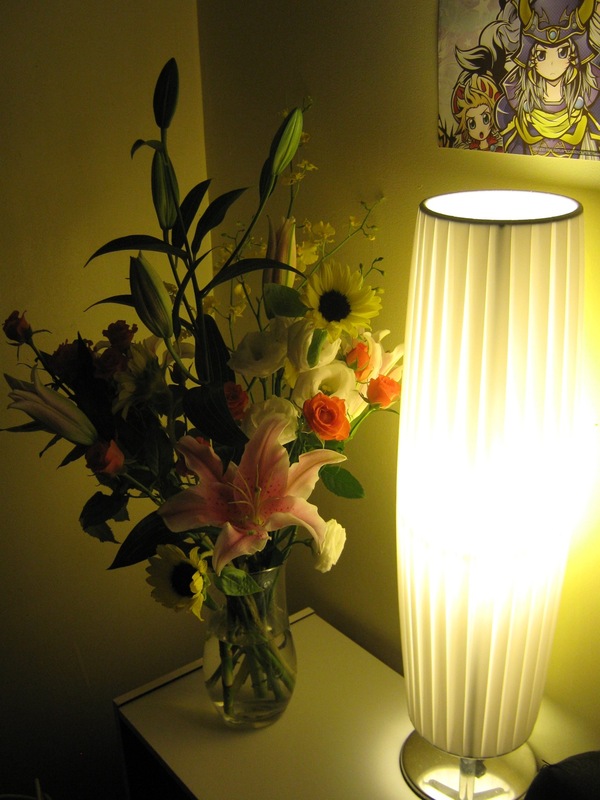 Once I got home I cut the stems so that the flowers would fit in the only vase I had in the apartment. Then I proceeded to take a bunch of artsy-fartsy photos of the bouquet, cuz that’s just how I roll. Now let’s try without flash and with backlighting! I was impressed; since they had grade assemblies after closing ceremony, it meant the girl had come up with and done this drawing in under an hour! Now, I had given calligraphic nameplates to the current 3rd year English Course in what had been my last class with them the previous academic year, and I wanted to make these for the other English Course homerooms. I got some scrapbooking paper with nice designs at InCube, cut it up, and did most of these freehand. Unfortunately, it took me two tries to do most of these. I used gold or silver ink to create a 3D effect. From left: Banana Cake, Chocolate Cake, (Sugar?) Cookies. All three girls can bake so well! 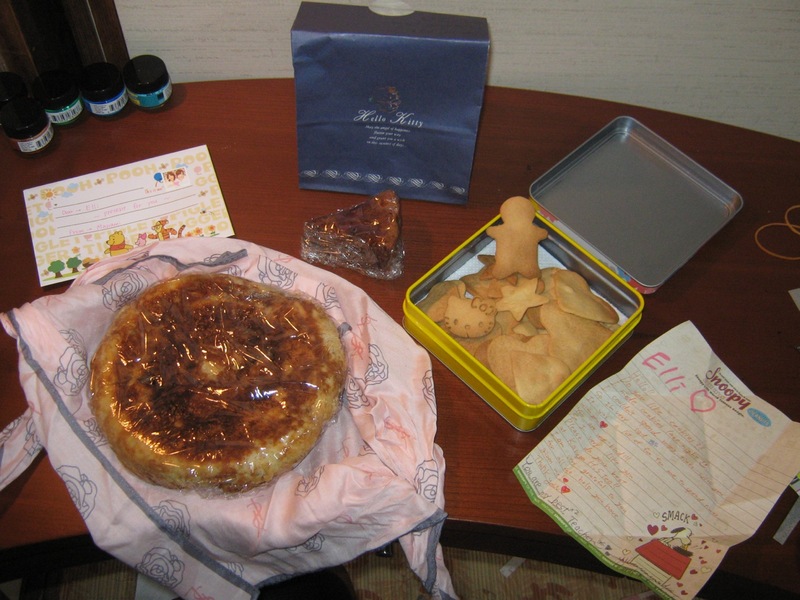 In my last day, a student who never talked to me happened to see me in the hallway as I collected my things from the LL. From down the hallway, she yelled to me in Japanese, “Sensei! I have a question about sentence structure, but…” She took out her Target Word Book and showed me the sentence in question. I don’t remember it, but that’s not the point. I’m pretty sure she just wanted to say something to me, so I was touched. 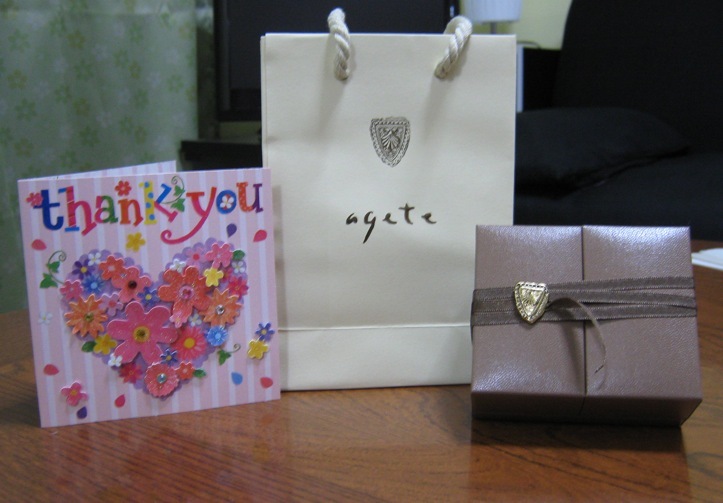 Completely unexpectedly, one of the teachers of Japanese gave me a present too. I had only talked with her a few times. 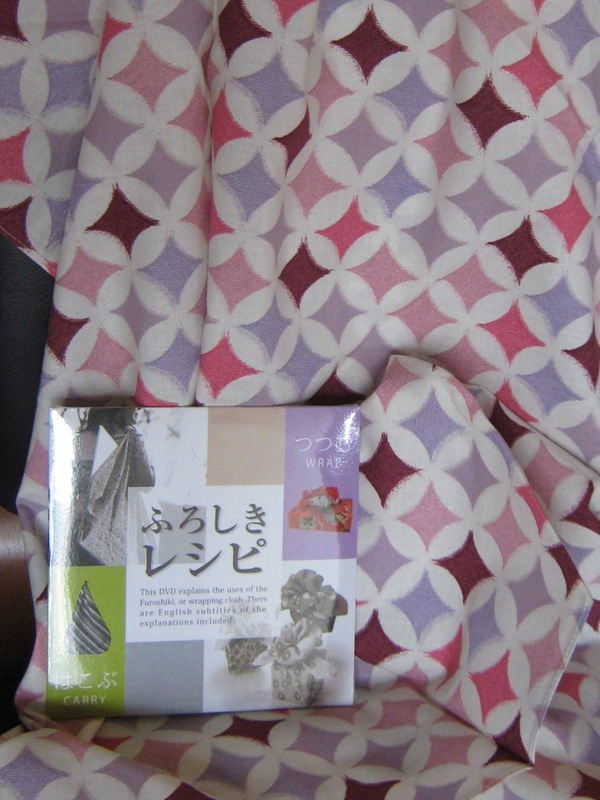 A furoshiki (wrapping cloth) with instructional DVD showing how to fold it in different ways depending on your purpose. So, there I was. I had cleared out and cleaned up my desk, turned in the keys to my desk, locker, and the LL card key, gotten some documents from the jimushitsu to take to the new school, and finished uploading my essay for the school magazine, which will be published in March. 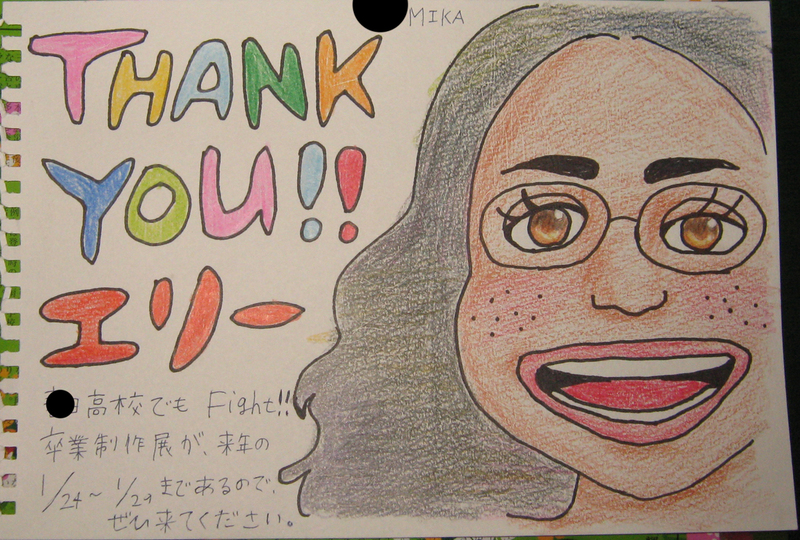 How should I spend my last moments as a teacher of my first Japanese high school? I decided to go watch the art students working on the backboards for taiikusai. There was an English Course student there watching, so I went up to him. He was having his mind blown by the students’ mad skillz. Even though he was a third year, he said he had never seen the backboards from the very beginnings, from the sketch stage. We talked about art and drawing while watching the students work. It was a great way to end the day. While we watched this, it started to rain heavily. I hung out a little longer in hopes that the rain would ease up, but since it showed no signs of doing so, I decided to just go and get soaked. I had told my successor that I’d be leaving my emergency raincoat in the locker for her, but I ended up taking it. Somehow, I had known that would happen. 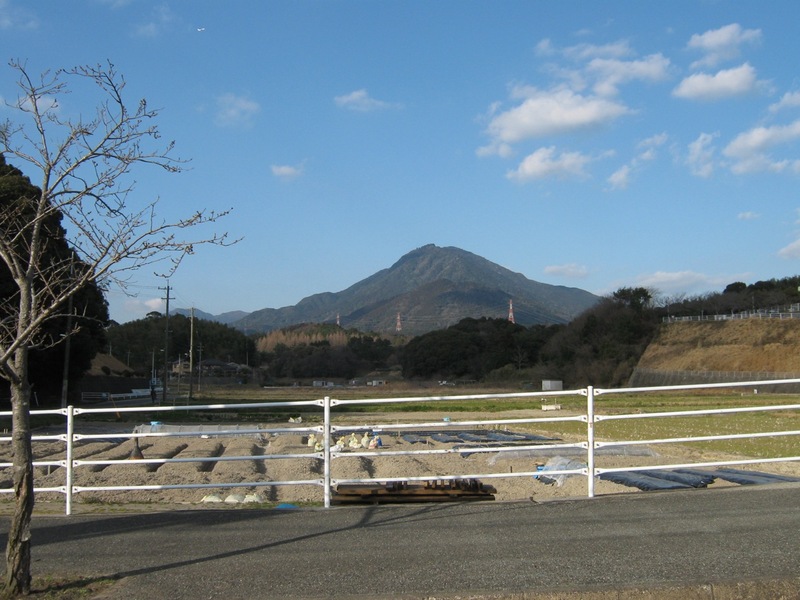 I had known Tenjin would see fit to soak me on my last ride down that hill. I began at my new school the day after my last at the old school. We got some administrative details done, and immediately after that jumped into practice for the English Recitation Contest. The next day I spent the morning cleaning my new desk. It was full to the brim with pens, pencils and markers, half of which I knew were probably dried out, and indeed, they were. As I sat there scrubbing with my bottle of Orange Clean I wondered if it was a rude thing to do on my second day, but…I couldn’t stand how dirty the desk was, and I was more than a little ticked at my predecessor for leaving it in that state. It was obvious the dirtiness was built-up over the years; I found an OWLS handbook (OWLS is a company providing ALTs), and the JET ID numbers of the JETs from 2003 and 2005 written in marker on the inside of the top desk drawer. *FACEPALM* But other than this, things seem to be going okay. The teachers and office staff are kind. The woman in the office in charge of handling the ALT stuff is on top of things and seems pretty spunky. She’s got 3 piercings in each ear! Well, it isn’t completely over with my new school; when the two schools’ events don’t overlap, I can go to both. I plan on going to my old school’s taiikusai. View from the bottom of the hill my old school is on. Taken in March. See the airplane? 次回！A particularly random RLS post.